Alpha-synuclein (α-SYN) is one of the key contributors in Parkinson’s disease (PD) pathogenesis. Despite the fact that increased α-SYN levels are considered one of the key contributors in developing PD, the molecular mechanisms underlying the regulation of α-SYN still needs to be elucidated. Since the 3′ untranslated regions (3′UTRs) of messenger RNAs (mRNAs) have important roles in translation, localization, and stability of mRNAs through RNA binding proteins (RBPs) and microRNAs (miRNAs), it is important to identify the exact length of 3′UTRs of transcripts in order to understand the precise regulation of gene expression. Currently annotated human α-SYN mRNA has a relatively long 3′UTR (2529 nucleotides [nt]) with several isoforms. RNA-sequencing and epigenomics data have suggested, however, the possible existence of even longer transcripts which extend beyond the annotated α-SYN 3′UTR sequence. Here, we have discovered the novel extended form of α-SYN 3′UTR (3775 nt) in the substantia nigra of human postmortem brain samples, induced pluripotent stem cell (iPSC)-derived dopaminergic neurons, and other human neuronal cell lines. Interestingly, the longer variant reduced α-SYN translation. The extended α-SYN 3′UTR was significantly lower in iPSC-derived dopaminergic neurons from sporadic PD patients than controls. On the other hand, α-SYN protein levels were much higher in PD cases, showing the strong negative correlation with the extended 3′UTR. These suggest that dysregulation of the extended α-SYN 3′UTR might contribute to the pathogenesis of PD. α-synuclein (α-SYN) is the major component of Lewy bodies (LBs) and Lewy neurites (LNs), the pathological hallmarks of Parkinson’s disease (PD) . Mutations and multiplication of SNCA gene coding for α-SYN protein have been strongly implicated in familial forms of PD [2–4]. Furthermore, in sporadic PD, the significant increase in α-SYN expression has been reported [5, 6]. However, the molecular mechanisms underlying the regulation of α-SYN expression that leads to the pathogenesis of PD remain unclear. The 3′ untranslated regions (3′UTRs) of messenger RNAs (mRNAs) play important roles in translation, localization, and stability of mRNAs through providing binding sites for RNA binding proteins (RBPs) and microRNAs (miRNAs) . Different lengths of the 3′UTRs are generated through alternative polyadenylation, and 3′UTR isoforms vary across tissue types [8–11]. It is noteworthy that neurons usually have transcripts with much longer 3′UTRs, suggesting a more complicated regulation of protein expression in this highly polarized cell [12–14]. Therefore, it is important to identify the 3′ ends of transcripts to better understand regulatory mechanisms conferred by the 3′UTR and their roles in pathological conditions. A recent study demonstrated that α-SYN transcripts have at least five different lengths of 3′UTR ranged from 290 to 2520 nucleotides [nt] and there are correlations between lengths of α-SYN 3′UTR and PD [15, 16]. Some of the single nucleotide polymorphisms (SNPs) that are located in the 3′UTR of α-SYN have been shown to be associated with sporadic PD [17, 18]. Together, the 3′UTR of α-SYN plays important roles in regulating α-SYN expression and eventually PD pathogenesis. Recent accomplishment of the ENCODE (Encyclopedia of DNA Elements) provides comprehensive information on tissue-specific gene regulations. Data suggest that the last exon of SNCA might be much longer than the annotated length, generating α-SYN mRNA containing the extended 3′UTR. In this study, we sought to identify this extended α-SYN transcript in human postmortem brain tissues and various human neuronal cell lines and its role in translational regulation of α-SYN. The use of post-mortem brain tissue was approved by the University of Central Florida Institutional Review Board. In the present study, 8 post-mortem brain samples without any neurodegenerative disease were used. The substantia nigra (SN) region containing brain tissues were obtained from the NIH Neurobiobank consortium. Ages ranged from 54 to 89 years and the post-mortem interval (PMI) varied from 10 to 30.25 h.
Four iPSC lines were generated from the skin fibroblast of control (SC1014, SC1015), and sporadic PD (ND35302, ND35322) obtained from Coriell Institute for Medical Research (Additional file 1: Table S1). Each iPSC lines had 2~ 5 clones from different batches of reprogramming. Using CytoTune® iPS 2.0 Sendai reprogramming protocol (Thermo Scientific), we reprogrammed fibroblasts into transgene-free iPSC. Fibroblasts were followed reprogrammed into transgene-free iPSC as we described previously . The iPSC were cultured on cell cycle arrested mouse embryonic fibroblasts (MEF) feeder cells in human embryonic stem cell media containing DMEM/F12, 20% knockout serum replacement (KSR), basic fibroblast growth factor (bFGF, 4 ng/ml), glutamine (2 mM), non-essential amino acids (NEAA, 0.1 mM) and β-mercaptoethanol (0.1 mM). The iPSC lines were differentiated into dopaminergic neurons following our previous protocol . Cells were cultured on laminin-coated (20 μg/ml) dishes in maintenance medium containing DMEM/F-12 with B27 supplement, glutamax, heparin (10 U/ml), gentamicin (50 μg/ml), bFGF (20 ng/ml) and epidermal growth factor (EGF, 20 ng/ml). Cells were grown in DMEM/F12 medium containing 10% fetal bovine serum (FBS), penicillin (100 U/ml) and streptomycin (50 μg/ml). Total RNAs were extracted from SN tissues using TRIzol and then they were treated with DNaseI (DNA-free™ Kit, Ambion) to remove contaminating genomic DNA. DNA-free RNAs were converted to cDNA using the amfiRivert cDNA Synthesis Kit (GenDepot) according to the manufacturer’s protocol. For negative RT reaction, nuclease-free water was added instead of RT enzyme. Synthesized cDNA samples were subject to PCR amplification of α-SYN using different sets of primers: F1 + R1, F2 + R2, F3 + R3, and β-actin. The following are primer sequence information: Human α-SYN Forward (F) 1; 5′-GTGGCTGCTGCTGAGAAAAC, Reverse (R) 1; 5′-CACCACTGCTCCTCCAACAT, F2; 5′-CTCCCGAGACATTCACCTGC, R2; 5′-TTTTGGTAAAGCCGACCGTG, F3; 5′-ACAGAAGCTATGAGTAACATGAGG, R3; 5′-TACACTCACTCACAACACTCAA, and β-actin F; 5′-GGAGTCCTGTGGCATCCACG, R; 5′-CTAGAAGCATTTGCGGTGGA. Total RNAs from neuronal cell lines (ReNcell VM and SH-SY5 cells) were similarly extracted described above and RNAs from iPSCs derived dopaminergic neurons were extracted using the RNeasy Plus Mini Kit (Qiagen). Total RNAs from LUHMES cells were kindly given by Dr. Coetzee (Van Andel Research Institute). Received RNAs were treated with DNaseI and cDNA was generatedas above. 3 μg of total RNA were used for 3′-RACE reaction. First strand cDNA was synthesized using SuperScript™ II Reverse Transcriptase (ThermoFisher Scientific) with a QT primer containing a 17 nucleotide oligo-(dT) sequence at the 3′ end followed by a 35 nucleotide sequence. Then, first round amplification for α-SYN ends was done using α-SYN 3′RACE F1 and Q2 primer set. The first round product was diluted to 1:20 in a Tris-EDTA solution and used for the second round amplification using α-SYN 3′RACE F2 and Q1 primer set. Third round amplification was done as described above using a α-SYN 3′RACE F3 and Q1 primer set. Final PCR product was confirmed using gel electrophoresis (Fig. 3a) and sent out for sequencing analysis. The followings are primer sequence information: QT; 5′–CCAGTGAGCAGAGTGACGAGGACTCGAGCTCAAGCTTTTTTTTTTTTTTTTT, Q2; 5′–CCAGTGAGCAGAGTGACG, Q1; 5′–GAGGACTCGAGCTCAAGC, α-SYN 3′RACE F1; 5′-ACCAGAAAGGTCAAGCCATGATAAGAAGCTT, α-SYN 3′RACE F2; 5′-GTCTGTGAATCACACTAGCAAATTATCAAACCT, α-SYN 3′RACE F3; 5′-CAGAAGCTATGAGTAACATGAGGACTC. Newly found sequence, the extended α-SYN 3′UTR, was reported to DDBJ/ENA/GenBank Databases. Nucleotide sequence data reported are available in the Third Party Annotation (TPA) Section of the DDBJ/ENA/GenBank databases under the accession number TPA: BK010481. 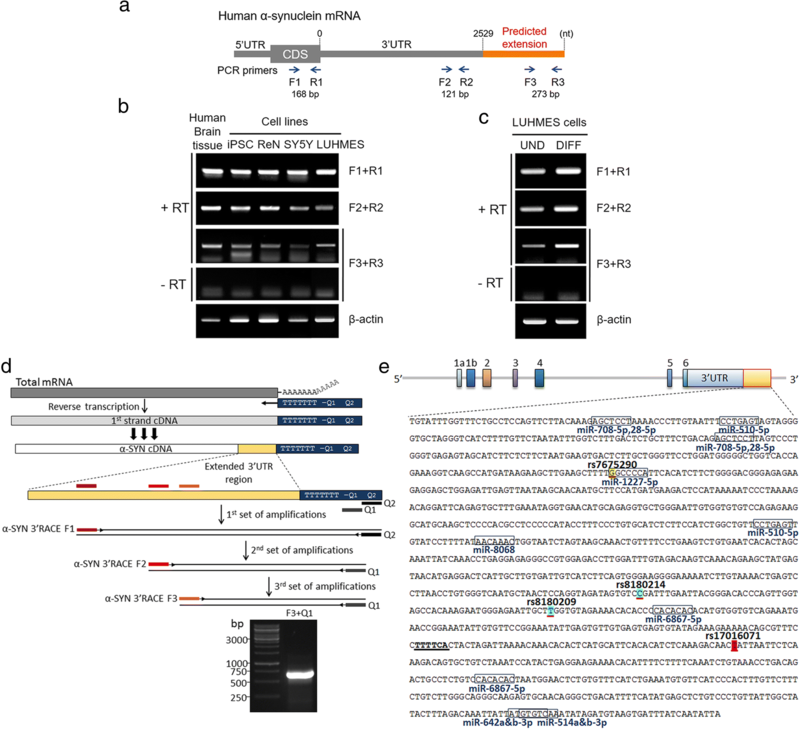 To generate luciferase constructs carrying the annotated (2.5 kb) or extended (3.8 kb) α-SYN 3′UTR, 2.5 kb or 3.8 kb of human α-SYN 3′UTR with terminal MluI and PmeI restriction sites were PCR-amplified from genomic DNA using a Q5 high-fidelity DNA polymerase (NEB). Then enzyme digested PCR products were inserted into a pMIR-reporter luciferase vector (Ambion). Constructs were confirmed by sequencing before using. For the luciferase assay, SH-SY5Y cells were co-transfected with firefly luciferase constructs containing either 2.5 or 3.8 kb α-SYN 3′UTR along with Renilla luciferase in 24-well plates using jetPRIME (Polyplus Transfection). Cells were collected after 36 h post-transfection and dual luciferase assay was performed according to the manufacture’s protocol (Promega). Relative luciferase activity was calculated by normalizing activity obtained for firefly to Renilla. Experiment was repeated three independent times. Protein concentrations were determined by the BCA assay (Pierce). Equal amounts of protein were electrophoresed on 8–16% gradient SDS-PAGE gels (Life technologies), transferred onto nitrocellulose membrane, and blocked with TBST (150 mM NaCl, 10 mM Tris-HCl pH 7.4, 0.05% Tween 20) containing 5% skim milk for 30 min. Primary antibodies were incubated at 4 °C overnight followed by HRP-conjugated mouse or rabbit secondary antibodies (1:5000, GE Healthcare) for 1 h at room temperature. Chemiluminescence (Thermo Scientific) was utilized to visualize the immunoblot signals. The following primary antibodies were used in this study: anti-α-SYN antibody (1:2000, 610787, BD Biosciences), anti-TH antibody (1:2000, NB300–19, Novus Biologicals) and HRP-conjugated anti β-actin antibody (1:50,000, A3854, Sigma). RBPmap (Version 1.1) was used to predict the RBP binding sites in the extended α-SYN 3′UTR. Sequence of the extended 3′UTR was screened for Human/Mouse RBPs binding motifs with high stringency levels (P-value < 0.001), yielding a total 74 RBPs. They were ranked by expression levels in the brain compared to other tissues based on HPA RNA-seq normal tissues data . Some of them have been reported by their roles in the brain. Together with results of their expression levels and their roles in the brain, a total of 13 RBPs were selected and listed in Table 1. Prediction of miRNAs targeting the extended α-SYN 3′UTR sequence was done through miRDB with custom prediction (http://www.mirdb.org). miRNAs with the highest target prediction scores (> 70) obtained by MirTarget algorithm were depicted in Fig. 3b. and their expression levels in human brain tissue were checked using the human miRNA expression database (miRmine) . PD implicated SNPs in extended 3′UTR were examined in regulome SNP database (http://regulomedb.org), as well as in the UCSC genome. Eight SNPs were found and four of them (rs7675290, rs8180214, rs8180209, rs17016071) were shown to be in tight linkage disequilibrium (r2 ≥ 0.95; in several populations) with a previously reported lead SNP (rs11931074) described in a large Japanese cohort using genome wide association studies with PD (http://regulomedb.org/GWAS/rs11931074_r2thr0.8_all.html) . Statistical analysis was performed with GraphPad Prism v.7.04 (GraphPad Software). Data are presented as mean ± S.E.M of each experimental condition. Two-tailed unpaired t test was performed in each experimental condition. To determine the correlation between extended α-SYN 3′UTR with α-SYN protein expression, two-tailed Pearson’s correlation was used for the groups followed by linear regression analysis. Values of p < 0.05 were considered significant. 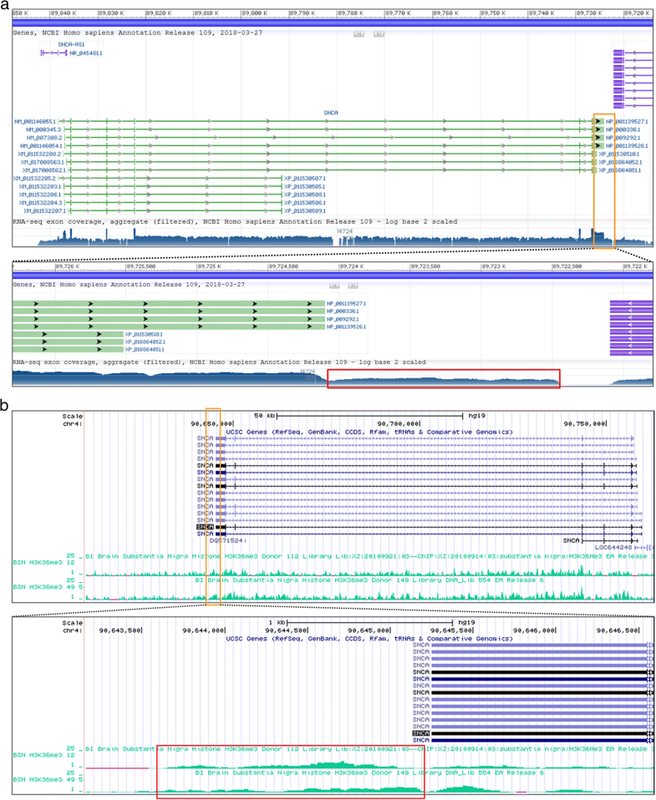 RNA-sequencing (RNA-seq) alignments on a genetic locus around the last exon of SNCA in NCBI Homo sapiens Annotation Release 109 shows the existence of RNA-seq reads on the region after the end of annotated last exon (Fig. 1a). In this same region of SNCA, peaks of trimethylated histone H3 at lysine 36 (H3K36me3) are also enriched (Fig. 1b). H3K36me3 has been known to indicate actively transcribed regions of the gene body [23, 24]. Therefore, together with RNA-seq coverage data and the continuous H3K36me3 on a genomic locus beyond the annotated last exon of SNCA implies existence of the extended 3′UTRs of α-SYN. Based on this analysis (Fig. 1a and b), we roughly estimated the length of the extended α-SYN 3′UTR to be about 1500 nt. In order to identify this extended α-SYN transcript, we designed three different sets of reverse transcriptase-PCR (RT-PCR) primers targeting the protein coding region, the distal region of the known 3′UTR, and the predicted extended 3′UTR; F1 + R1, F2 + R2, and F3 + R3, respectively (Fig. 2a). RT-PCR was performed on the SN tissue of postmortem brains, human iPSCs-derived dopaminergic neurons, ReNcell VM (human ventral mesencephalic neuronal progenitor cells), SH-SY5Y cells (human neuroblastoma cells), and LUHMES cells (immortalized human dopaminergic neuronal precursor cells). Regardless of the types of cell lines or brain tissue, the extended 3′UTR was successfully amplified (Fig. 2b). To exclude the possibility of genomic DNA amplification, the same sets of RNA samples without RT reactions (shown as “- RT”) were included, confirming no genomic DNA contamination. Moreover, we compared the expression levels of the extended 3′UTR before and after differentiation of LUHMES cells. Interestingly, α-SYN transcript containing the extended 3′UTR was proportionally increased as LUHMES cells were differentiated (Fig. 2c). Next, to find the last sequence of the extended α-SYN 3′UTR region, 3′-Rapid Amplification of cDNA Ends (3′-RACE) was performed (Fig. 2d). With DNA sequencing, we confirmed that the extended 3′UTR contains an additional 1246 nt after the longest known annotated α-SYN 3′UTR (2529 nt) (Fig. 2e). Our findings extend the end of the last exon of SNCA by 1246 bp that can generate human α-SYN mRNA having the maximum 3775 nt-length 3′UTR. To explore whether the extended α-SYN 3′UTR affects translation of α-SYN, we generated luciferase reporter constructs carrying the annotated (2.5 kb) or extended (3.8 kb) α-SYN 3′UTR (Fig. 3a). Firefly luciferase constructs containing either 2.5 or 3.8 kb α-SYN 3′UTR along with Renilla luciferase were transfected into SH-SY5Y cells. Luciferase activity was significantly lower in cells transfected with the extended α-SYN 3′UTR compared to the 2.5 kb α-SYN 3′UTR (Fig. 3b), suggesting that additional cis-elements in the extended α-SYN 3′UTR negatively regulate translation of α-SYN. Next, we investigated the expression levels of extended α-SYN 3′UTR from iPSC-derived dopaminergic neurons from sporadic PD patients and control subjects. Surprisingly, level of the extended α-SYN 3′UTR from sporadic PD iPSC-derived dopaminergic neurons (sPD) was significantly lower than one from control dopaminergic neurons (CTRL) (Fig. 3c and e), even though total α-SYN mRNA levels were higher in sPD (Fig. 3c and d). On the other hand, α-SYN protein levels were significantly increased in sPD without changing tyrosine hydroxylase levels (Fig. 3f, g and h). The strong negative correlation between the expression of the extended α-SYN 3′UTR and α-SYN protein levels was found in these iPSC-derived dopaminergic neurons (Fig. 3i). The length of the 3′UTR affects its translation, localization, and stability through providing binding sites for RBPs and miRNAs . Altered expression of RBPs may affect the 3′UTR length. Therefore, it is worth to explore the potential regulatory cis- elements and cognate trans-factors, RBPs, present in the extended 3′UTR. Predicted RBPs using RBPmap  were ranked according to their brain-specific expression levels and known roles in the brain. The 13 highest-ranked RBPs which are feasible in regulating α-SYN in the brain are listed in Table 1. Next, we investigated the number of miRNA binding sites in this region using the MirTarget algorithm (miRDB) [26, 27]. Ten miRNAs showing the highest target prediction score (> 70) are depicted with their binding sites (Fig. 2e). Among them, has-miR-708-5p and has-miR-28-5p have high expression in human brain tissues . We also have looked for SNPs in this extended region from the SNP database (RegulomeDB and UCSC genome) in search of PD association. We found four SNPs: rs7675290, rs8180214, rs8180209, and rs17016071. These four SNPs are in strong linkage disequilibrium (r2 ≥ 0.95) with a downstream disease implicated SNP (rs11931074) that is strongly associated with PD in all HapMap 2 populations as found in the genome-wide association study by Satake et al., 2009 (Fig. 2e) . The current reference sequence length of the longest human α-SYN 3′UTR is 2529 nt. In the current study, we identified α-SYN transcript having a much longer 3′UTR—an additional 1246 nt, in fact— in postmortem human brain samples and iPSCs-derived dopaminergic neurons, as well as various human neuronal cell lines, further extending the last exon of SNCA. Recent studies have demonstrated that mRNAs containing the longer 3′UTRs, on average, were exclusively observed in the nervous system when compared to other tissues, suggesting neuron-specific functions of the extended form of 3′UTR [12–14]. The longer extended form of α-SYN 3′UTR identified in this study confers an additional intricate regulation that might be important for specific neuronal functions or pathological conditions. In fact, we found that the longer extended α-SYN 3′UTR is expressed more in differentiated LUHMES cells when compared to undifferentiated conditions. 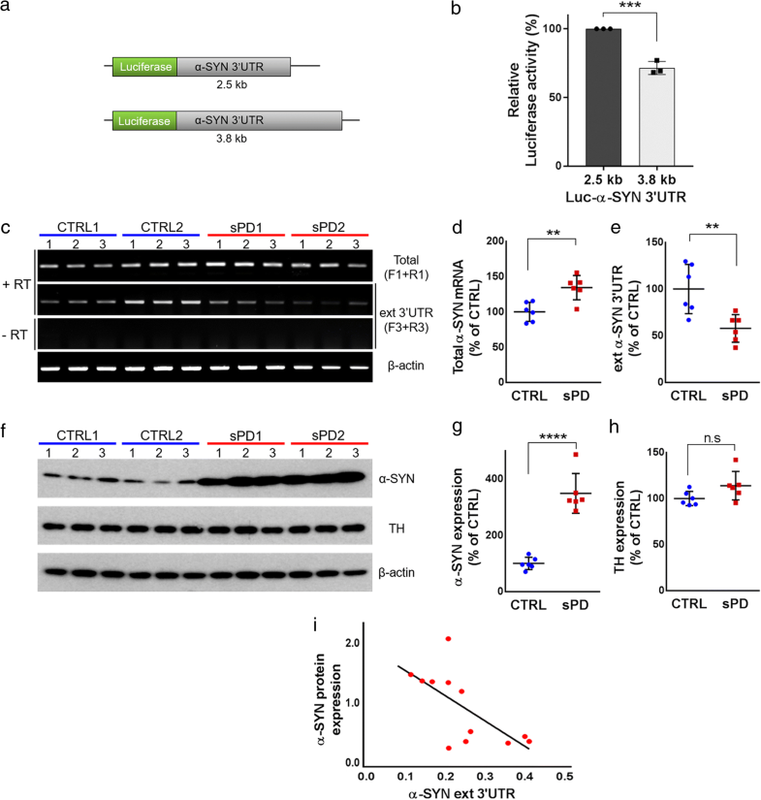 The extended form of α-SYN 3′UTR, however, was decreased in sporadic PD iPSC-derived dopaminergic neurons in contrast to increased α-SYN protein levels. These suggest that aberrant expression of the extended α-SYN 3′UTR may influence PD pathogenesis. Changes in RBPs may affect the production of 3′UTR with different lengths. We found 13 potential RBPs that can bind to the extended 3′UTR of α-SYN based on high expression levels in the brain. In addition, 10 miRNAs were predicted to bind to this region. Further studies are necessary to determine the mechanisms underlying regulation of the extended α-SYN 3′UTR, which might bring new therapeutic targets for human diseases especially in PD. Finally, several annotated SNPs were found in the newly identified 3′UTR region. Four SNPs, although not evaluated in PD, are shown in significant linkage disequilibrium (r2 ≥ 0.95) with another lead SNP (rs11931074) downstream of the gene. This SNP was significantly associated with PD in the Japanese population in a large GWAS study . Moreover, these four SNPs were originally described as being located in the “intergenic region” on chromosome 4. With our discovery of the extended 3′UTR of SNCA, these variants will now be included within the SNCA 3′UTR region. In summary, the present study identified the longer extended form of human α-SYN 3′UTR and its negative correlation with α-SYN translation. These findings would bring forth a better understanding not only how α-SYN expression is regulated but also how the length of α-SYN 3′UTR is involved in PD pathogenesis. Authors gratefully acknowledge the financial supports provided to YSK by Michael J Fox Foundation for Target Advancement 2015. Authors also would like to thank Dr. Coetzee at Van Andel Research Institute for providing RNAs from LUHMES cells. This study is supported by Michael J Fox Foundation for Target Advancement 2015 to YSK. Nucleotide sequence data reported are available in the Third Party Annotation Section of the DDBJ/ENA/GenBank databases under the accession number TPA: BK010481. GJ and YSK designed the study. GJ and SPY performed experiments and analyzed the data. SGT was involved in the bioinformatic analysis. GJ wrote the manuscript. GJ, SGT, HSK and YSK edited the manuscript. All authors read and approved the final manuscript. The NIH Roadmap Epigenomics Mapping Consortium. http://www.roadmapepigenomics.org. Accessed 09 May 2018.